A few weeks ago, we shared bassist Rebecca Johnson and her band in our daily video feature, and reader feedback was terrific. So it was easy to pick Rebecca as our bassist in the spotlight for the week of August 9, 2011. Rebecca Johnson is a bass player/singer with 29 years professional experience in the music industry. Rebecca’s aggressive, funky and percussive slap technique has become her playing trademark. She has toured and recorded with many bands including major Australian recording artists like Ian Moss, Margaret Urlich and Richard Clapton. The Rebecca Johnson Band is her own project which has been constantly gigging for the last 9 years. The RJ Band CD Handbrake Free Zone is her greatest achievement and her band is currently working on a follow up CD. I’m a full-time bass player and singer and never had a day job, ever! Luckily for 29 years I’ve always done live gigs, and my band is the busiest we’ve ever been. I guess you could say my ‘day job’ is always making sure we have gigs in the book. My band doesn’t go through an exclusive agent-we get our own gigs. Been gigging live for 29 years. Playing all-up for 33 years. 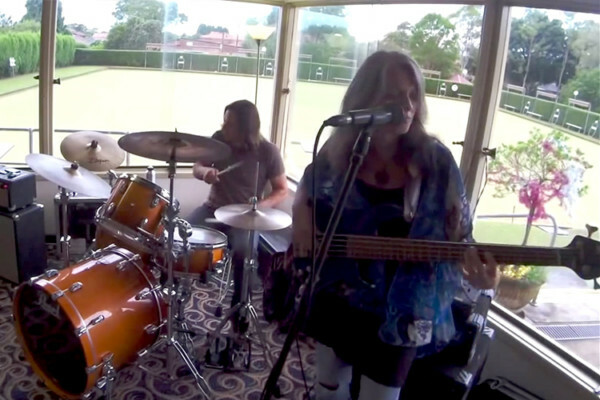 I have been playing exclusively in my own band The Rebecca Johnson Band for nine years now and we do a lot of gigs all over Sydney, Australia. We also have a strong following in Newcastle which is two hours north of Sydney and has a great live music scene so we travel up there almost weekly. 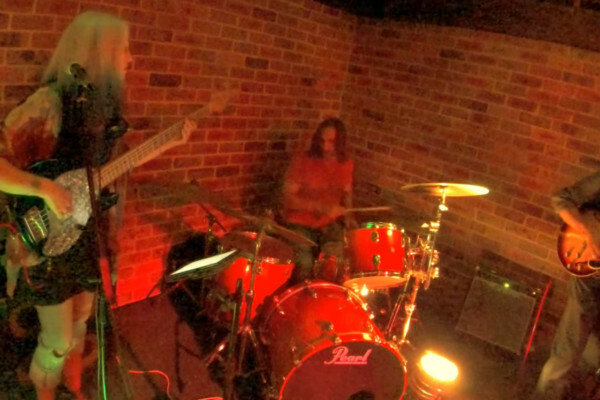 I am lucky to have the most awesome players in my band – Con Settineri on drums and Mark Johns on guitar. Con and I were playing together in another band ten years ago, and it was he who suggested I front my own band and be the lead singer as well as the bass player. So we got the RJ Band happening back then and have been gigging constantly ever since. We’ve had some incredible players play with us both live and on our CD. 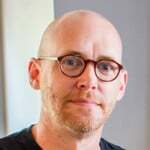 Mark has played guitar with us now for 3 years. The musicianship of these guys is world-class. We have all done heaps of big gigs and tours over the years which is great for your resume, but the three of us like being a part of something solid and have our CD to show for it. I have three basses. I’ve had my Music Man Stingray since 1988 – it was my main bass for 20 years. I still use it on a gig occasionally, but it’s a 4 string and I prefer playing my 5 string Yamaha BBG5A which has been my main live and recording bass now for about three years. I also have a “lawsuit model” Ibanez Silver Series Jazz bass which is also a 4 string. I recorded 12 of the 14 songs on my band’s CD using the Ibanez. For 20 years I’ve been endorsed by an Australian company named Labsystems, and I use one of their hand-built amplifiers – the SS-600 – and also their 4 x 10 speaker cab. I’m not really into lots of pedals and effects but my secret weapon is just the one killer pedal by Xotic Effects-the RC Bass Booster. I’ve always used Ernie Ball strings as they have a long life span. I tend to play really hard which kills my fingers but the strings stay bright at least. My father, Keith Johnson is a bass player and my mother, Mandy Johnson is a singer. I’ve been raised in a family of musicians and all I ever knew as a kid was listening to great players on albums that my parents would always play. I used to pick up my dad’s bass and teach myself to play. I had piano lessons for six years but always preferred practicing on my dad’s bass. Around the age of 12, I discovered funk bands and wanted to learn how to play bass like Larry Graham, Marcus Miller, Jaco Pastorius, Rocco Prestia, Mark King etc. That was heaps more inspiring to me as a young kid than practicing scales on the piano. My biggest “claim to fame” is the dedication and commitment of my own band. Having released our CD Handbrake Free Zone – that’s my biggest “bass superpower” as it documents my playing/singing/writing and pretty much shows what I’m about as a musician. 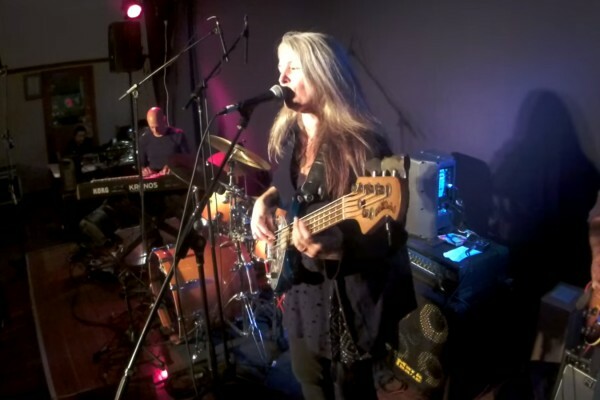 I’ve done amazing live gigs, clinics, sessions, toured with big name Aussie artists and had endorsements over the years which is all good, but really I think my true “bass superpower” is yet to come… The new tracks on our upcoming CD are really exciting for me both in the playing and singing departments. Can’t wait to get our new stuff out there! Oh yeah, and meeting Richard Bona after his Sydney gig last year. If I really had to choose bass players they would be Marcus Miller, Richard Bona, Abe Laboriel, Pino Palladino and many others. I’ve recently been listening to killer bass players like Henrik Linder, Rochon Westmoreland, Cornell Williams, Doug Johns and Gianni Serino, who all deserve more recognition.